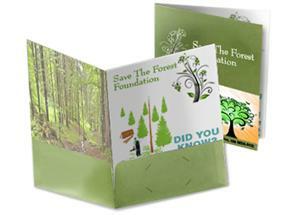 Toronto Folder Printing: Full Colour Presentation Folders: as low as $0.33 ea. Lowest Prices in Toronto, Canada! Printed full colour on 95 bright 14 pt. card stock with glossy AQ coating. A Presentation folder is a kind of folder that holds loose papers or documents together for organization and protection. Our Presentation folders printed on 14 pt card atock material which is folded in half with pockets in order to keep paper documents. Presentation folders function much like that of a file folder for organizational purposes. They can be used, amongst other things, as a tool for business presentations to customers to aid in the sales process. Presentation folders come in many different styles to suit a variety of purposes. Most all are produced to provide marketing for a product (business) and/or service, but they can fulfil other functions. A few examples would be a company producing a new product and wanted to show their customers all the benefits of that product in an organized fashion, or folders used to organise documents for distribution to delegates at a conference.